It’s as if Hard Rock Vallarta asked me what are five of your favorite things at an all-inclusive resort and then added them to the property. Every day I discovered something else that I love and look for in my favorite hotels. From boogie boarding, a huge pool with a swim up bar, and a water slide to an ocean view room and 24-hour room service, Hard Rock Vallarta hit the nail on the head with its services and amenities. I love the ocean. 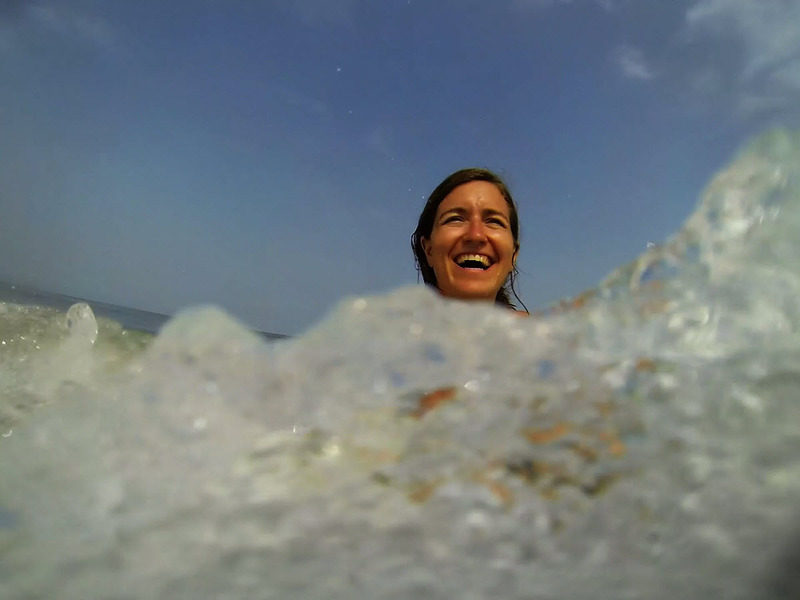 I grew up swimming and playing in the waves with my family. 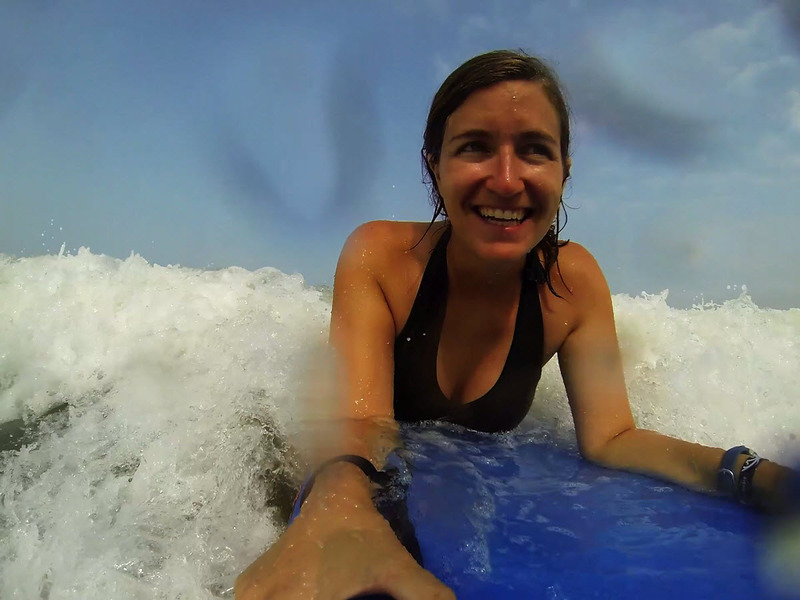 Boogie boarding filled my childhood and adult life with fond memories and it will always bring me to a happy place. Most resorts offer a few non-motorized water sports but it’s rare to see a boogie board, which is funny because it’s a cheap investment. When I realized that the Hard Rock offered boogie boards, I knew how I’d be spending my afternoon. Darren and I took turns playing on the beach with Athena while the other played in the water on the board. The waves weren’t huge but certainly large enough to ride into the beach. It’s funny how calming it is to have the waves rushing behind me when I’m just ahead of them on a boogie board. Sometimes I’m nervous of the marine life around me when I’m just floating in the water, but it’s the last thing on my mind when I’m riding the waves. If I’m not in the ocean, I still like to be in the water. Can you see the joy on my face? The pool options at the hotel incorporate all aspects of fun into one massive play area for adults, children, and the ones like Darren and I who can’t decide. 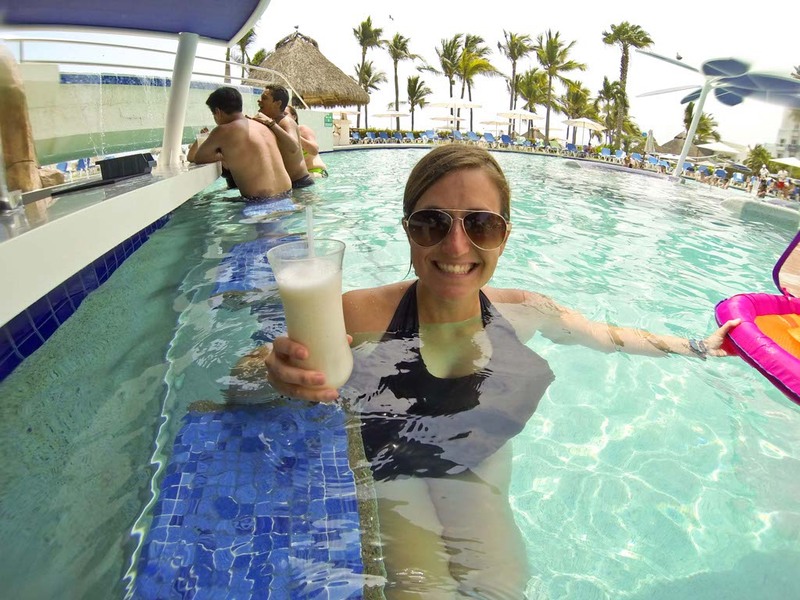 The swim up bar can be dangerous… in a good way. The choices are endless. We were delighted to test out a number of options before choosing a strawberry, banana pina colada as our go-to drink. With Athena comfortably situated in her water float, we could push her around the pool and enjoy a refreshing drink on the side. We made sure to drink and swim responsibly so we had separate Athena time and drink time. 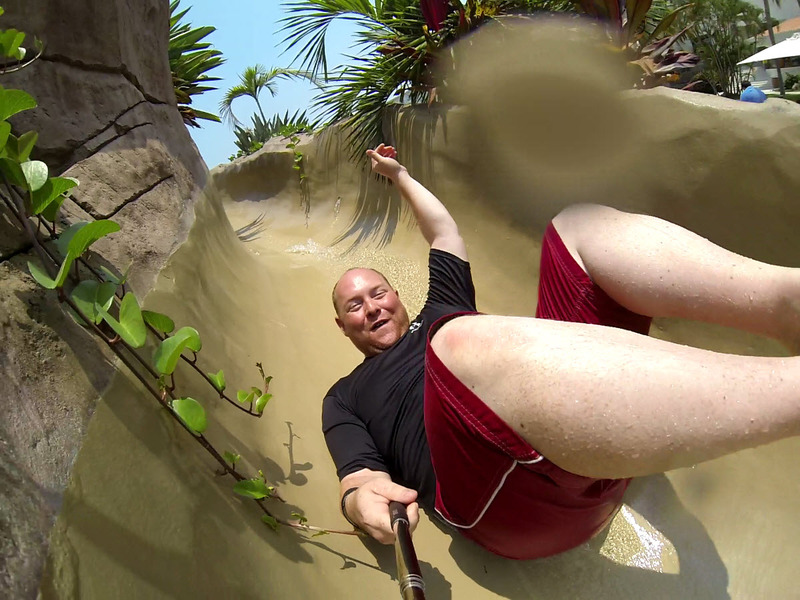 On the other side of the pool, after swimming under a beautiful waterfall, is a water slide. I’m not sure if you caught my embarrassing video, but it’s easy to see that I’m still a big kid at heart. At least you can see that Darren married someone with his own maturity level when you watch his video. I don’t know who’s the bigger kid. Athena is in for a lot of embarrassing moments throughout her life. Since Athena’s bedtime is between 7 and 7:30 pm, we spent most evenings in the hotel room but with a balcony, an ocean and pool view, and unlimited, all-inclusive room service, the evenings were just as fun as the days. We watched the sunset from our balcony and had a drink while Athena slept in room. We quietly shared our favorite moments from the day and rather than watching tv, we looked at photos and videos from our trip. It never seemed like we were stuck in a hotel room because the scenery and company were the best entertainment. It didn’t take us long to look into room service. Hard Rock might not have invented room service, but they definitely perfected it. Their three page menu offered everything from snacks to main entrees to desserts. The first night we ordered mixed fajitas served with guacamole and tortillas. We didn’t need to order drinks because our room was equipped with a stocked fridge and a Hard Rock liquor dispenser. It was all at our disposal and restocked daily. Since then, we’ve ordered breakfast, appetizers, and desserts; it always showed up in style and within twenty minutes. That’s what I call perfected room-service. 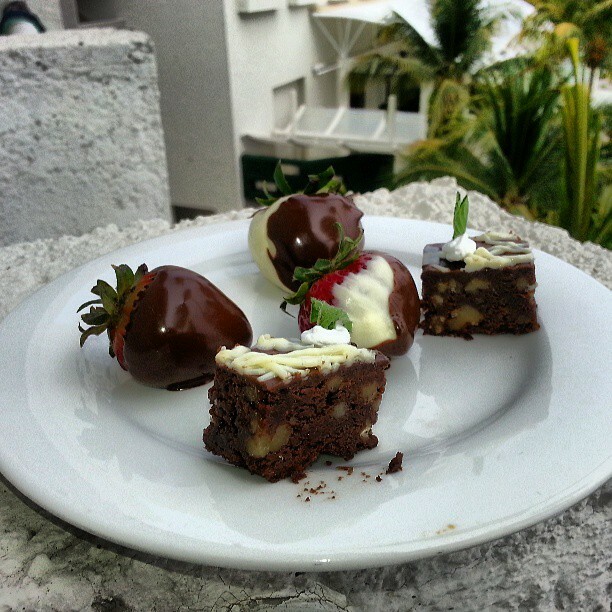 Heck, just five minutes ago someone showed up with chocolate covered strawberries and we didn’t even ask for them. Tomorrow our stay at Hard Rock Vallarta will come to an end but the memories we’ve created here will remind us to return soon. The quote on our wall says, “are you going to be in my dreams tonight?” – The Beatles. 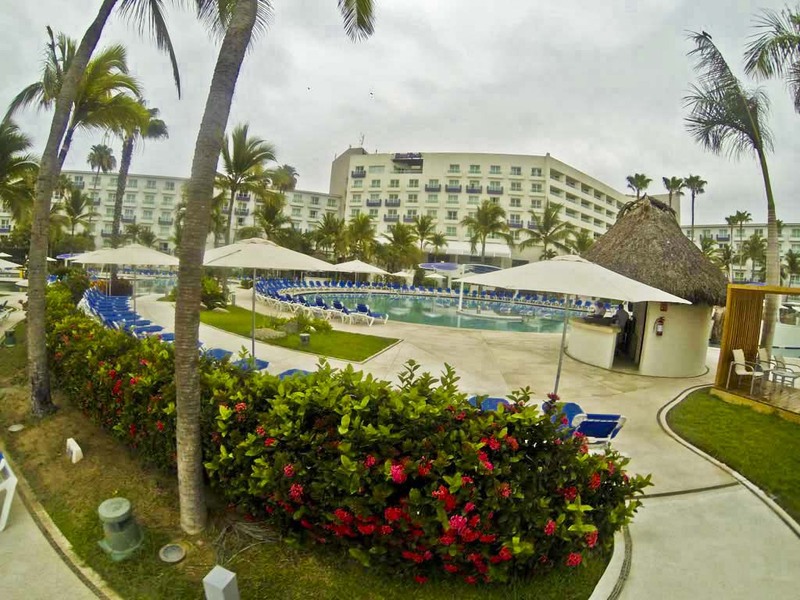 The ocean, the pool, the fun, the room… Hard Rock Vallarta will be in my dreams regularly until I return. 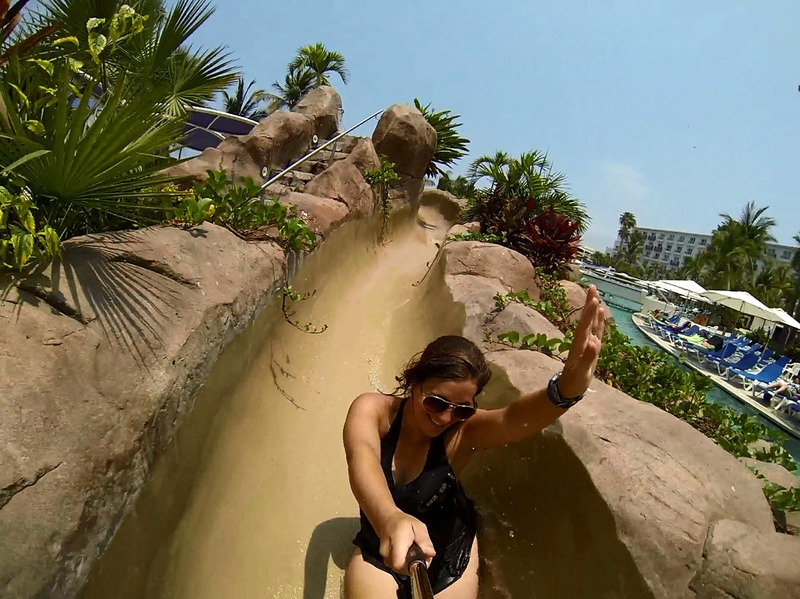 This entry was posted in Hard Rock Vallarta, Hotel Reviews, Hotels, Mexico, Travel and tagged bucket list, Bucket List Publications, bucketlist, GoPro, Hard Rock Vallarta, Lesley Carter, Mexico, photography, RockVallarta, travel by lesleycarter. Bookmark the permalink. Sounds like a great place to stay! It’s amazing! I always loved Mexico anyway, but now it’s even higher on my list of top places to visit. I usually never go to the same country twice but I’ve been to Mexico five times. I’d like to try out other Hard Rock Hotels now that I know how amazing they are. I hear there is another one in Cancun; that might need to be on next year’s list. Love an all-inclusive! Nothing like the unlimited drinks at the swim up bar. Never a boring moment 🙂 Which one is your favorite? I was telling a girlfriend about your trip because she and I need to go. Glad you had a great time. Sounds like you all had a fabulous time!! It was fun to see your pictures. They are great!! Congratulations, you have been nominated for an award. What, pray tell, is a Hard Rock Liquor Dispenser? I have no idea what it is, but it’s forcing me to appreciate it. (Is it some amenity above and beyond the stocked bev refrigerator? Very intriguing!) We’re leaning toward a Mexican jaunt for my August birthday, just for a 4-day getaway. The Hard Rock Vallarta is getting serious consideration, now. The water slide for adults was a deal-maker for me, but the addition of boogie boards, huge pool and this “Dispenser” may have sealed a res. I’m actually going to call for rates this week and will let you know if it works out. Gracias, Lesley. You look like you were having so much fun! I love your boogie boarding video clip. Oh, this place sounds so lovely! There’s also a Hard Rock in Punta Cana. Love the Palace Resorts for their great resort credit value and amazing food and service! Really top quality for an all-inclusive, at a reasonable price, too. What fun! Glad you enjoyed yourselves. I would LOVE To go there, too. Maybe someday . . . .
Great photos! Such fun! It reminds me that I desperately need a vacation. I love your posts. You guys are having waaaaaaaaaaaaaaaaay too much fun. What a fabulous resort. Why can’t adults have as much fun as short people? Just reading your post made me feel like I was on vacation. FUN! Hat dies auf ein "neuer Süßer" / a new "sweet One" rebloggt. It all looks great and it sounds like you’ve had a great time! A swim-up bar – now that’s on MY bucket list! You simply couldn’t be any cuter! Awesome! If you can then do visit India also…have seen your post on Asia and i assumed that you have not been to India..
Now I definitely want to go back to Mexico! Great post, amazing writing! You are an inspiration! I thought I was travelling when my mom took us all around to see all our relatives in 1 year. We went to California, to Oregon, to Michigan & a few other states. We had fun wherever we went. I just never got to enjoy anything as in hotels. I always got to go to motels. But maybe I will get to go travelling soon with my girlfriend I just met. She has been in the Army & also been to different countries which she wants me to go around with her soon. What a life I will have again as I make money from everywhere around the world!